Motivated by the success of such products as drug-eluting stents (DES), the medical device industry is delving deeper into the exploration of drug-device combination products that enhance patient care by delivering a one-two therapeutic punch. And as the market potential and clinical need for these devices continue to grow, it's becoming increasingly apparent that the medical device industry may soon be struggling with a serious drug addiction. Incorporating drug-delivery platforms onto medical devices offers the benefits of controlled release and localized delivery of drugs, which can improve efficacy of treatments for cardiology, ophthalmology, and orthopedic applications, among others. But in the quest to create novel drug-eluting stents, balloons, catheters, cardiac pacing leads, and other such devices, design engineers need to carefully consider the biomaterial employed in the coating and its interaction with the selected drug in order to achieve the desired release and degradation profiles. SurModics offers both durable and degradable polymeric drug-delivery systems for such applications as drug-eluting stents. Perhaps most of all, however, engineers need to make sure that they don't lose sight of the clinical need for the flashy new combination product they are designing. "[OEMs sometimes] overengineer the product to the point where the complexity of the system far outweighs--and may not be justified by--the clinical utility gained," states Donato DiBiase, director for drug delivery, DSM Biomedical (Geleen, Netherlands). "Engineers must be in constant contact with end-users to assure that the product they develop will serve the patient population at hand and their needs." When developing a polymeric drug-delivery technology, medical device manufacturers must decide between a durable or degradable system for their application. Durable, or permanent, polymer coatings remain on an implanted device even after the drug has been fully released. With degradable polymer-based coatings, in contrast, the polymer backbone degrades as the drug is released. As a result, the biocompatible polymer is absorbed into the body, leaving nothing behind on the surface of the device. "Clinical data showed that first-generation drug-eluting stents, especially, showed a risk for subacute thrombosis, a severe complication," says Chris Koppenborg, business development manager, medical coatings, for Bayer MaterialScience (Leverkusen, Germany). "Scientists believe this [risk] could be caused by polymers that may cause negative effects after the drug has been fully released. Therefore, the use of highly biocompatible, noninflammatory [permanent] polymers or [degradable] bioabsorbable polymers is very important." Because a durable polymer coating may remain in the body long after its functional purpose is fulfilled, it is imperative, as Koppenborg notes, that the material does not induce an inflammatory response in vivo. Furthermore, coating integrity, determined by strength, flexibility, and a secure adhesion of the polymer coating to the medical device substrate, is also paramount. Seeking to achieve these objectives in a durable polymer system, Bayer offers the Baymedix CD 500 permanent drug-eluting coating. Based on a two-component approach, the coating can provide controlled release of therapeutic agents over time periods ranging from several hours to several months. Drug release is determined by the programmable blend of hydrophilic and hydrophobic elements of the polymer, Koppenborg explains. "The amount of hydrophilicity triggers the amount of water penetration and exchange, and, therefore, the kinetics of the drug release," he adds. To ensure adhesion of the Baymedix polymer coating to the medical device, Bayer relies on chemical functionalization of the substrate as part of a three-step process. Once the substrate has been activated, a primer layer is applied. Finally, the drug-eluting polymer--programmed to deliver the desired release kinetics--is added. Although suited for delivery of most available drugs, Baymedix has been tested with Sirolimus and Paclitaxel for DES applications. The coating technology is also capable of simultaneous release of multiple drugs. And while there remains a demand for durable drug-eluting polymer systems, progress in drug-delivery technology has thrust degradable platforms into the spotlight in recent years. As the key enabler of degradable drug-delivery systems, the bioabsorbable polymer poly (lactic-co-glycolic acid), or PLGA, has served as a springboard for more complex and completely new coating formulations that are, in some cases, contributing to improved release kinetics. "There's been an evolution from the chemistries of the traditional PLGA polymers to more modified PLGAs that have a bit more functionality," observes Bob Hergenrother, senior director, research and development, for SurModics Inc. (Eden Prairie, MN). "There are even ones with completely new building blocks, such as amino acids or polysaccharides." As part of this material evolution, SurModics has developed the degradable SynBiosys drug-delivery system. A modified PLGA polymer, the SynBiosys technology marries PLGA building blocks with urethane linkages to yield what the company claims is a more flexible system. "We can now better match the drug release with the degradation rate of the polymer so you don't have this period where the polymer's still present but there's no longer any drug," Hergenrother explains. The system offers controlled release of a given drug via a diffusion mechanism. As the drug is diffusing out of the polymer matrix, the polymer begins to degrade, resulting in a more-linear release profile. But the rate at which the drug is released is affected by a variety of factors, Hergenrother notes. "We use different blends of these polymers," he explains. "We can change ratios of a fast- and a slow-releasing polymer, and changing the polymer formulations and drug formulations affects release." For example, hydrophilic, or water-soluble, drugs tend to elute quickly while hydrophobic drugs typically release at a slower rate. However, these release rates are tunable to a certain extent. Coating application parameters, such as deposition rate or concentrations, can also factor into the final drug-release profile. Although PLGA is regarded as the industry-standard material for degradable drug-delivery platforms, some coatings companies have been motivated by the polymer's limitations to experiment with alternative materials. "Polyesters such as PLGA and modifications of the PLGA family have dominated the market for several decades but are not optimal due to bulk hydrolysis degradation, suboptimal release kinetics--unwanted bursts--and, in many cases, a resulting acidic environment associated with degradation of the polymer," comments DiBiase of DSM. 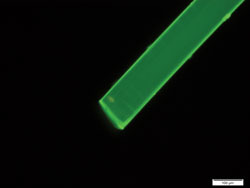 DSM's PEA fibers (shown here with fluorescent dye under fluorescent light) offer an alternative to PLGA materials for degradable drug-delivery systems. Exploiting a polymer originally developed at Cornell University (Ithaca, NY), DSM has developed a family of polyesteramide (PEA) materials for degradable drug-delivery applications. Unlike PLGA, PEA controls drug-release profiles via enzymatic degradation, a process that results in increased flexibility for designing such features as extended release durations, according to DiBiase. "DSM's polyesteramides provide better control over drug-release kinetics," he says. "And, via unique characteristics such as surface erosion, they deliver both short- and long-term release times while degrading into natural products, which are recognized by the body and also highly biocompatible." Like the SurModics SynBiosys technology and other systems, DSM's PEAs offer controlled drug release that is dictated by the rate of diffusion of the drug through the polymer matrix. However, the PEAs also feature enzymatic degradation and surface-erosion traits that provide an added level of control over drug release, according to DiBiase. "Changes in chain mobility of the polymer backbone--rigidity and morphology--can be used to control the rate of release of the drug and further tune the erosion profile," he says. This level of control, DiBiase adds, is advantageous for such applications as next-generation drug-eluting stents, for example. The PEAs demonstrate potential for use in ophthalmology, cardiovascular, pain-management, and orthopedic applications as well. Selecting the most suitable drug-delivery platform for an application is a critical aspect of developing a drug-eluting device or combination product. But there are a host of other, equally important, factors to consider during product design. Chief among them is that the polymer does not alter the drug once it is incorporated into the coating. If the polymer that comprises the delivery platform chemically links to the therapeutic agent it houses, it can effectively change the structure of the drug, according to Hergenrother of SurModics. Materials as well as processing techniques or conditions--such as the rate of evaporation of a solvent--can also affect the crystalline structure of the therapeutic agent, resulting in different polymorphs of the drug. "Relatively sophisticated tools are needed to examine some of these things, and all of the different crystalline forms of a drug do not behave the same in the body in terms of their activity rate," Hergenrother states. Because of these and other intricacies associated with designing combination products, engineers should involve coating companies early on in the process to avoid difficult rework at a later stage of development or a suboptimal design. "If you are designing a drug-eluting device, try to incorporate that part into the design as early as possible and not just say, 'we'll add the coating later,'" Hergenrother advises. "If you don't, many other parameters may get locked into place that may pose a problem with the drug or the polymer down the line." The drug-eluting polymeric coating must withstand certain mechanical stresses on the end device, for example. If the coating component is taken into account during early design phases, engineers may be able to relieve some of these stresses, resulting in a more-robust system. Likewise, engineers that address the coating component of the device up front can avoid potential late-stage setbacks or difficulties associated with sterilization. "If you have a device that can only work with EtO but a drug that only works with E-beam, for example, that can pose a serious problem," Hergenrother says. "By adding a drug to a device, it does raise the complexity and the potential interactions that can occur with all of the aspects of that device," he adds. "They're certainly manageable, but they need to be considered in their totality." Although advances in convergent technologies have enabled the development and improvement of an array of novel drug-device products, the field remains wide open. To get to the next level, however, drug-delivery platforms must demonstrate better long-term performance and biocompatibility characteristics, according to Koppenborg of Bayer. He also notes that improved mechanical properties will open the door to the use of drug-delivery platforms in such applications as peripheral and superficial femoral artery stents, as well as to more advanced, completely absorbable DES. Drug instability within the polymer matrix of a delivery system can result in crystalline growth, which, in turn, can affect drug-release properties. Building on the success of DES, drug-eluting balloons (DEBs) are regarded by many as 'the next big thing' in terms of combination products. The subject of intense interest since about 2003, DEB technology is available in Europe but has lagged in the United States, having just been approved for clinical trials. According to "Drug-Eluting Balloon Technology," an article in the August issue of the journal Cardiac Interventions Today, potential advantages of DEBs include homogeneous distribution of the drug; better reendothelialization of the stent, if used, resulting in a reduced risk of late stent thrombosis; and a decreased opportunity for chronic inflammation attributed to the presence of a polymer. Use of a DEB could also eliminate the need for a stent or other permanent implant in some scenarios, offering a less-invasive, potentially safer treatment method. But DEB technology is not without its challenges, of course. Drug-eluting balloons face the daunting task of eluting the drug, typically the antiproliferative agent Paclitaxel, within a very limited timeframe of about 30 to 60 seconds. It is also imperative that the DEB does not leak or lose the drug prior to inflation at the target location. "It's a fascinating area and the concept is very attractive," Hergenrother says. "If you can inflate and deliver a drug in 30 seconds to a minute without leaving anything behind, there are a lot of advantages to that."